Like the parallel universe version of “The Slip”. This should come as no surprise to the vast number of you who follow this show on a regular basis, but as our magical 20th episode “The Slip” proves, Franks and Beans continues to hang precipitously on the forefront of new technological advances on the Funny or Die website. You may have noticed the upgrade in aspect ratio over the last few weeks – most evident in the black bars on the sides of most videos that shamelessly plug the very website you’re visiting. That’s because Funny or Die now broadcasts in widescreen, and Franks and Beans was the first to usher in this new change with the debut of “The Slip”. To think, Will Ferrel, Will Arnett or even Will Rogers could have started the show with one of their own videos of babies cursing or something equally funny, but no – they chose us. And what an honor it is! At least it is in my fantasy world where I am friends with Mr. Ferrel and we hang out to trade ideas on great new comedy sketches and he even lets me drive his car. But really – Funny or Die broadcasts in widescreen now, and so does Franks and Beans. Who did it first is unimportant. But it might have been us. “The Slip” is more than just a technological breakthrough that we will all be benefiting from well into the next century, though – it’s also chock full of interesting back-story that you, the discerning viewer, crave so ravenously. The ideas behind most Franks and Beans episodes generate spontaneously, which I’m sure comes as little surprise, but “The Slip” was really a 4th-quarter miracle, and it owes its creations to the fact that I was hungry for breakfast this chilly morning. Running out the door toward another full and enriching day of filming, I managed to grab a banana that was about one or two days from being too brown to eat (unless you like to eat bananas with a straw). I needed to eat it, as I feel sad if one lonely banana has to get thrown away rather than fulfill its destiny of becoming nutrients for my insides. Now, despite what any cartoon of a man falling into a trash dumpster may tell you, I don’t think that banana peels are inherently funny. What we have here is an idea that has its moment, what, 200 years ago?, and ever since we’ve been beating the same horse to death over and over. Yes, the inside of a banana peel is relatively slick. Yes, given the ABSOLUTE IDEAL CONDITIONS, a well-placed banana peel might cause someone to slip a bit. So what we’re playing with here is not the idea that banana peels are funny, but society’s unnatural preoccupation with this simple sight gag and what might really happen if anyone actually tried to pull the stunt in real life. What we’re left with is at least a variation of the trick of misdirection – instead of going for the obvious skull-busting slip, we’re hopefully making the more mundane ending funnier because of that. There’s the anticipation, the build up, the waiting, and then…! nothing. And I love it. This isn’t to say that something like this is new or original to Franks and Beans, as it harkens back to the ultra-short “An Old Joke” episode, where we basically did the same thing but in verbal form. What’s funny about the feedback I received is that some people actually expected Larry to say “He didn’t say!” in that particular episode, and I got some of the same reactions with this newer episode – a few called it beforehand – “oh, you’ll slip on the banana peel.” It’s hard for me to believe comments like this, because really, why would that be funny? In any remote way? Is Franks and Beans that unimaginative that we’d do the equivalent of reading a knock-knock joke online? Oh Lord, I hope not. 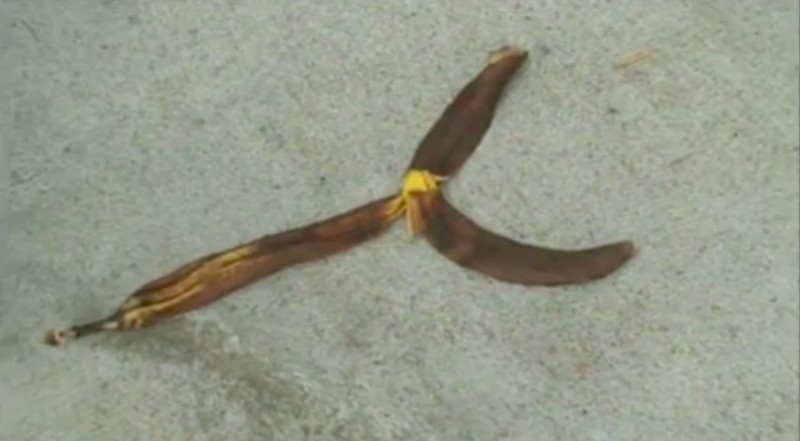 If anything, people should get bored by saying “oh, you’ll do something other than slip on the banana peel.” I mean, I guess that leaves someone disappointed either way, but at least this way I can live with. If you didn’t quite enjoy the ending to this particular episode, take heart! For your deliverance is at hand. Or at any rate, there’s a second chance for this one to be funny, as I had two endings in mind when I thought of the basics to “The Slip”. Rather than pick the strongest ending like a serious filmmaker, Larry and I decided to film both – the second of which will be released with the much-ballyhooed alternate ending! See, Hollywood is rubbing off on us more and more every day. Which will you prefer? Think of it like one of those “Choose Your Own Ending” books that were popular 20 years back, except there’s no chance of you falling into a snake pit this time around. Lastly, I’ll admit that coming up with 19 different “NO!” sequences for the end of episodes has been challenging, even if the first five or so were just the same thing over and over (what was with those?!). That’s why I’m always dumbfounded when something as brilliantly simple as Larry gargling takes me this long to figure out before we use it. We did two takes of this ending, and between them Larry had to change shirts because he got water all over the first one. What I’m saying is, I didn’t want to give the impression that he was lactating or anything if we went with the second shot, which we did during the editing stage. That was inappropriate. I shouldn’t have insinuated that Larry has the mammary glands of a woman, which release a milky fluid in times of stress or extreme concentration. Why would I put something out there like that? It could lead to the spread of vicious, hurtful rumors that probably aren’t true, and I don’t want that to happen. Not even a little.